I didn't get to do anything on my fourth day since my flight was a little too early. I had to travel pa going to Kalibo. After I had my breakfast, I checked out of the hotel. I went to Tambisaan port instead of the Cagban Port. I paid PhP 20 for the terminal fee. I paid another PhP 200 for the boat and van. We waited at the van, and I got worried that I won't reach the airport on time. It was almost 10am, and my flight was at 12nn and we were still waiting for one passenger. I decided to pay for that slot. It would save me a lot of money as compared to booking another flight. So there, that's my first ever solo trip in Boracay. Let me share my expenses. 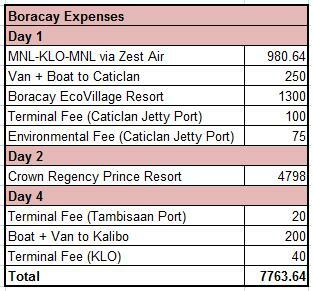 I spent PhP 7763.64 for this trip plus food. No pasalubong. :P If you want to check my Boracay adventures, feel free. I arrived late in the afternoon so I chose to spend my time at the Punta Bunga beach which is just few minutes away from the resort. I went to Puka Beach the next day, my most favorite place in Boracay. I moved to Crown Regency Prince Resort which was my accomodation for the next two days. I also spent my afternoon at the White Beach. I was more comfy alone on my Day 3, and enjoyed beach bumming more by this time.